Gene therapy-based modulation of atrioventricular (AV) conduction by overexpression of a constitutively active inhibitory Gα i protein effectively reduced heart rates in atrial fibrillation (AF). However, catecholamine stimulation caused an excessive increase in ventricular rate. We hypothesized that modest genetic suppression of a stimulatory G protein in the AV node would allow persistent rate control in acute AF and would prevent undesired heart rate acceleration during β-adrenergic activation. 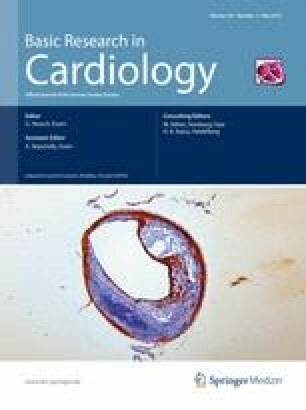 Atrial fibrillation was induced in 12 pigs by atrial burst pacing via an implanted cardiac pacemaker. Study animals were then assigned to receive either Ad-siRNA-Gαs gene therapy to inactivate Gαs protein or Ad-β-gal as control. Gαs protein inactivation resulted in a 20 % heart rate reduction (P < 0.01). AH and HV intervals were prolonged by 37 ms (P < 0.001) and 28 ms (P < 0.001), respectively, demonstrating atrioventricular conduction delay. Impairment of left ventricular ejection fraction (LVEF) during AF was attenuated by Gαs suppression (LVEF 49 %) compared with controls (LVEF 34 %; P = 0.03). Isoproterenol application accelerated ventricular heart rate from 233 to 281 bpm (P < 0.001) in control animals but did not significantly affect pigs treated with Ad-siRNA-Gαs (192 vs. 216 bpm; P = 0.19). In conclusion, genetic inhibition of Gαs protein in the AV node reduced heart rate and prevented AF-associated reduction of cardiac function in a porcine model. Rate control by gene therapy may provide an alternative to current pharmacological treatment of AF. P. Lugenbiel and D. Thomas contributed equally to this work. We thank Jennifer Gütermann, Sina Huntscha, and Bianca Menrath for excellent technical assistance and Muhammed Kashif (Department of Medicine I and Clinical Chemistry, University of Heidelberg) for help with histological quantification of fibrosis. This study was supported in part by grants from the Deutsche Forschungsgemeinschaft and from Medtronic (to A.B. ), from the University of Heidelberg and the Deutsche Forschungsgemeinschaft (FRONTIERS program to D.T. ), from the ADUMED foundation (to D.T. ), from the German Heart Foundation/German Foundation of Heart Research (project F/06/10 to D.T.) and from the Max-Planck-Society (TANDEM project to P.A.S.). Pacemakers, leads, and burst pacing software were kindly provided by Medtronic.